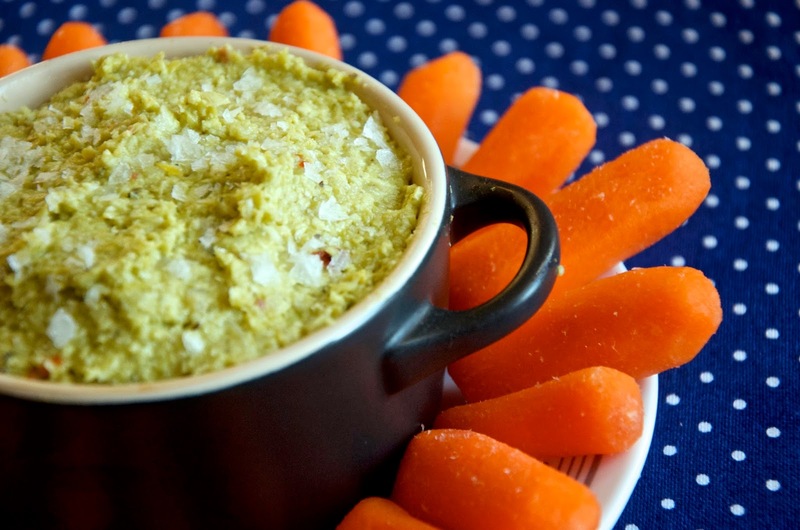 I love this Edamame Pea Dip. It's so easy to make, so tasty and I don't feel guilty about eating piles of this with carrots as a munchy snack any time. I find this mash-up is just as much on a slice of toast - think an alternative to mashed avocado on toast and I wouldn't say no to it smeared on a piece of grilled chicken or served alongside a piece of baked salmon as a potato alternative either. 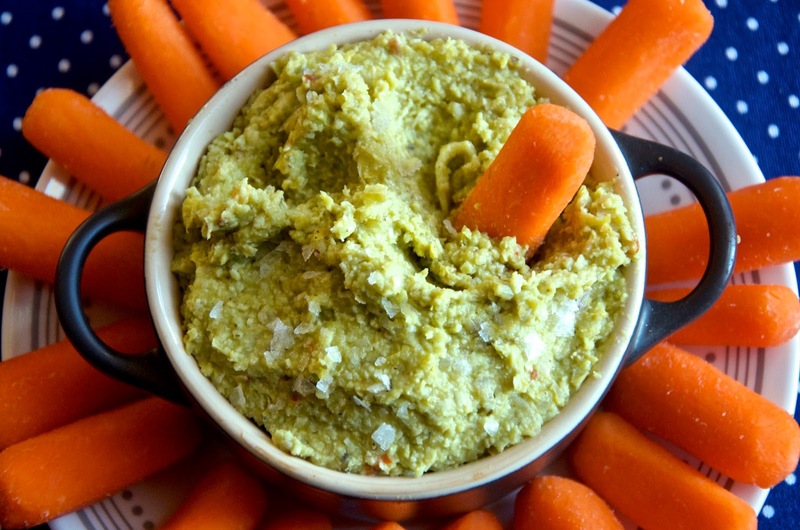 This dip is so delicious and my favourite way to serve it is very simply, yet colourfully next to a pile of baby carrots with a little sea salt on the side for sprinkling. 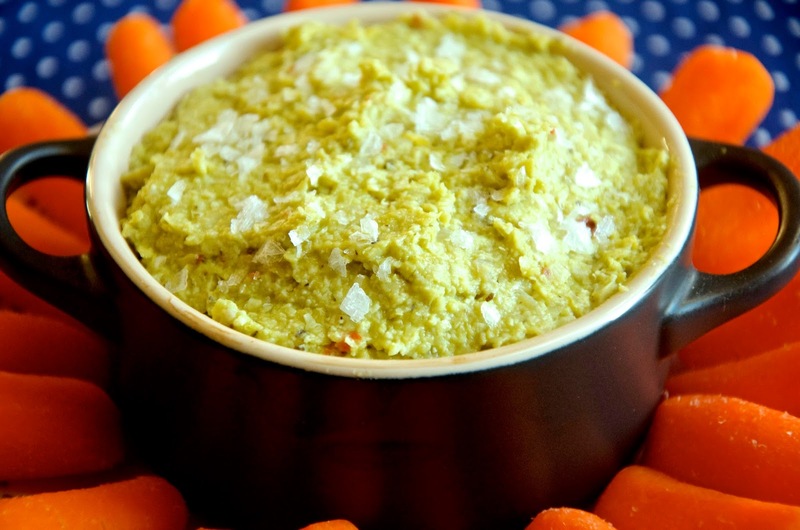 I'll happily put this out at a party, serve it as a nibble before serving dinner when I have friends over or more often than not, I'll whip up a batch of this Edamame Pea Dip on Sunday to have in the fridge to munch on throughout the week. I never get tired of it and because most of the ingredients are frozen or long-lasting, it's not too much of a challenge to be able to make this any old time. If you don't have a food processor, there's no reason why you can't make this, but it will require a little more effort. You'll want to mince the garlic and shallots by hand as finely as humanly possible and you can do the rest of the combining with a potato masher. Also, to make this recipe vegan or dairy-free, simply substitute 3 tablespoons of regular olive oil for the butter. 1. Boil the edamame and peas according to their packet instructions. You want the peas to be tender. Strain both as they are done and set aside. 2. Meanwhile, heat the 25g of butter (or olive oil if that's what you're using) in a frying pan over medium heat. Cook the shallot until it's soft and starting to look translucent. Add the garlic, mint and dried chilli flakes. Continue to cook, stirring for another minute or two taking care not to burn it and remove the pan from the heat. Tip this mixture into the bowl of a food processor immediately, using a rubber spatula to scrape and get all the herbs and oil out of the pan. 3. Tip the peas, edamame beans and shallot mixture into a food processor. Add the lemon zest, about 1/2 the lemon juice and the 75ml of extra virgin olive oil. Season with a sprinkling of sea salt flakes and a generous grinding of pepper. Whiz the mixture until it has the consistency of a paste. If necessary, add more olive oil, a little drizzle at a time while still whizzing. Taste the dip and adjust seasoning as necessary and add more of the lemon juice if you prefer and whiz further to combine. Use your rubber spatula to scrape down the sides and whiz again to make sure all of the mixture is combined and smoothly blended. 4. Spoon the dip into a bowl or serving dish, cover with cling film and chill in the refrigerator for at least 3 hours or until time to serve. 5. Uncover, sprinkle generously with sea salt flakes and serve alongside baby carrots, crisp flatbreads or whatever cut vegetables you prefer. Sometimes I like to keep some sea salt flakes alongside the dip to re-sprinkle as and when. This is of course optional, but there's something about the crunchy salt flakes that really adds to this dip. Click on the images below to shop the pieces featured in this recipe.